Our Orders Module give you the ability to manage orders directly through the PSS dashboard. Some users rely on PSS exclusively for orders management while others manage orders through their marketplace backend, or a 3rd party shipping software. Once you integrate/connect a 3rd party marketplace (Amazon, eBay) to your PSS application, PSS will pull in all of your past order information and continue to pull in your orders every 15 minutes on a daily basis. PSS will not take action on any of your previous orders. Utilizing the PSS Orders module is completely optional. Once you are in the PSS Orders Module click the "View" button which is on the far right. This will essentially pull up a packing slip and have pertinent information to the way that PSS was aggregating or fulfilling the inventory for the order. The SKU notated in the Order Notes at the top is the SKU that the buyer purchased. The Ship To and Bill To information identifies the specific fulfillment information of your buyer. The Marketplace Order ID is the order from the specific marketplace. Under Available SKU you will see all other distributor SKUs that you may be able to fulfill from in addition to the one that was originally purchased. If you are utilizing the PSS Orders Module you can also update/edit the status of your orders by clicking the Edit button on the far right side of the screen. There is a dropdown to toggle the order from New, to Fulfilled, to Cancelled, to Deleted. There is a box to check when payment has been captured, and additional ones for when the packing slip has been printed or downloaded. You can input Tracking right into PSS and it will push to the marketplaces automatically. The Notes field at the bottom provides further notation on how PSS was aggregating the inventory and if it was drop ship eligible. To print a packing slip simply highlight the row of the order you are shipping, then click the Print Selected button at the top. 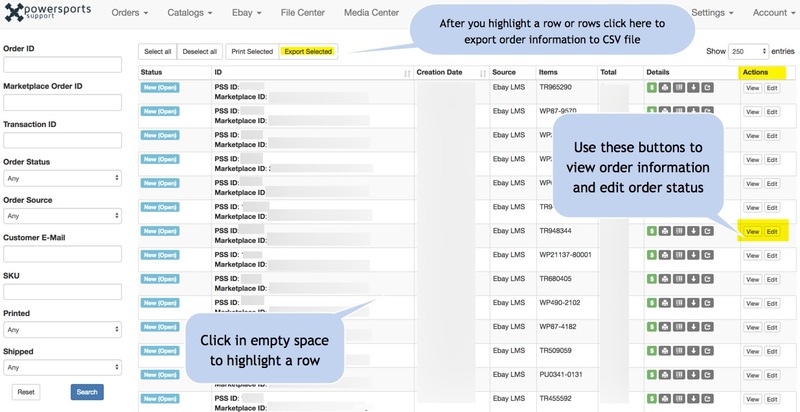 If you wish to export order data en masse to a CSV file simply proceed to the main orders page and highlight the rows of orders that you want. Next click the Export Selected button. You can input a notification email if you would like. You also have the option to check the box to mark the status for the order(s) as User Downloaded. After you finish the export command you will find your CSV file in PSS File Center. It will be listed at "Client: Export Orders" and have a processing or completed status flag on the right. Click into the blue hyperlink and retrieve your file. This CSV contains several columns of order data. Here is a sample of an orders export. Information specific to the buyer/seller has been removed for privacy purposes.